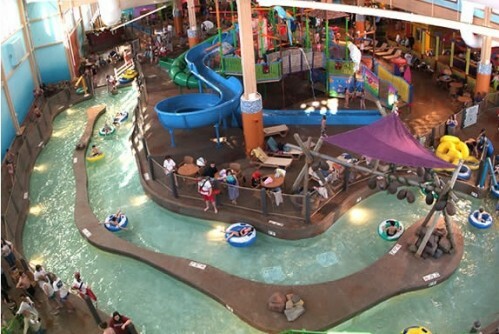 Home » Travel Month ~ 8 Cool Indoor Waterpark Hotels! Families looking for a quick get away without the cost of flying south may want to look at spending a couple nights at an indoor waterpark hotel. 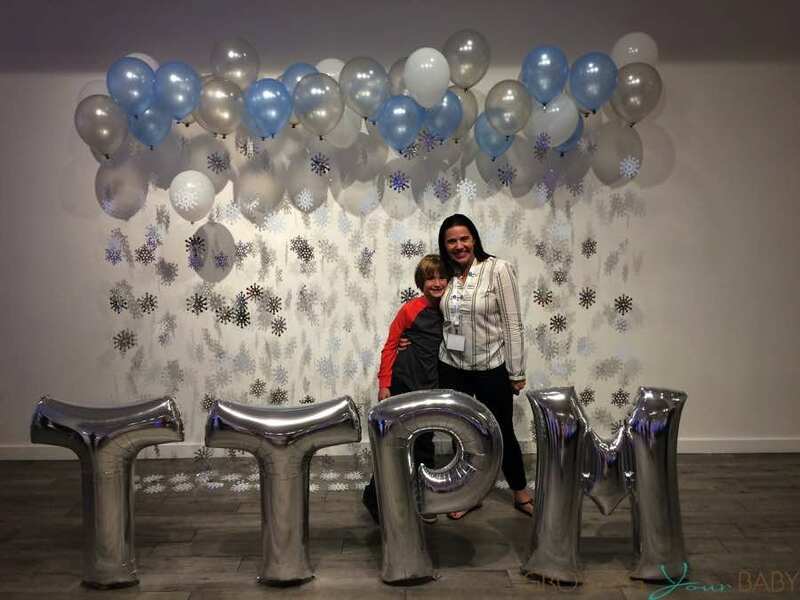 Located all over the US and Canada, these full featured resort-like hotels are a great destination for families who want to get away but don’t want to go far. They are perfect for a 2 day vacation and offer more excitement than most 5 star resorts! With some of these waterparks offering hundreds of thousands of square feet of play, they are a destination, not just a place to stay. We have listed some that have that impressed us. Here are our 8 favorites! 1. 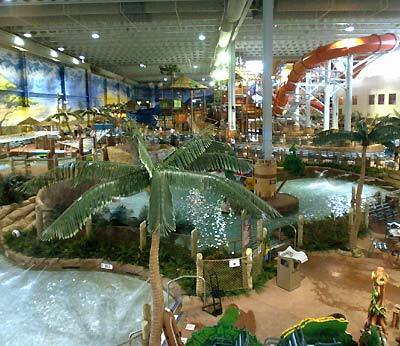 Dubbed ‘America’s Largest Indoor Waterpark’, Kalahari Resorts has locations in Wisconsin, Ohio and soon to be – Virginia. Families can relax in their own private indoor cabana or catch some rays under the Texlon transparent roof while enjoying the 12,000 sq. ft. wavepool! Thrill seekers will love the Swahili Swirl 60′ diameter bowl raft ride, Zip Coaster uphill water rollercoaster waterslide, Cheetah Race 4 lane mat slides, Rippling Rhino or Victoria Falls raft rides. In addition to all of the excitement poolside, this authentic African themed resort offers a variety of suites that can accommodate families from 4 -8 people. 2. Fallsview Indoor Water Park, Niagara Falls – The Fallsview Indoor Waterpark is Niagara’s newest and largest indoor waterpark. This waterpark offers an impressive 3 acres of indoor water fun including sixteen thrilling waterslides (some as high as six stories), a massive indoor wave pool, year round outdoor sundeck, an activity pool, the mammoth “Beach House” Aqua Play area and much more. 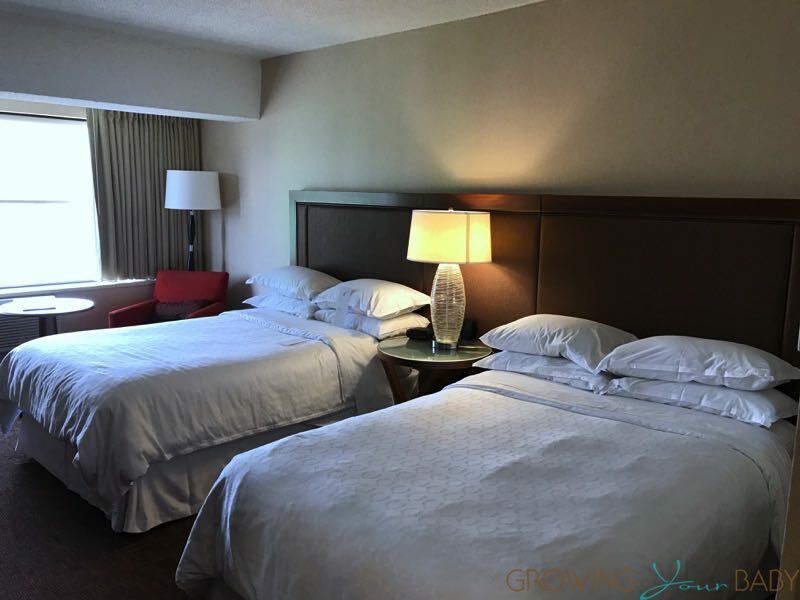 For your convenience, the Fallsview Indoor Waterpark features direct indoor connections to three of Niagara Falls hotels, the Sheraton on the Falls, Crowne Plaza Niagara Falls-Fallsview Hotel and the Skyline Inn. 3. 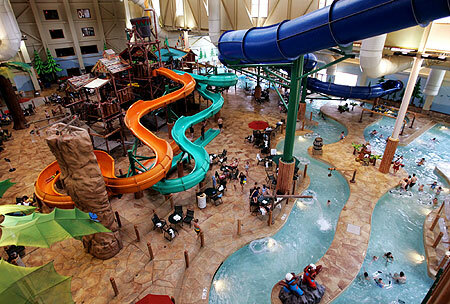 Great Wolf Lodge -With 12 locations, Great Wolf Lodge is the biggest chain of indoor waterparks in North America. And while not every location offers the same features each one has an expansive water play area that includes huge water slides, pools, a giant water fort and a lazy river to ensure that the whole family has a good time. When bedtime comes your family can join all of the other pajama-clad kids down at the Clock Tower in the lobby to wind down with Story Time. Some suites are decorated to feel like you are at camp. Your crew will love sleeping in their own a private and cozy tent right inside your room, complete with bunkbeds and their own TV! 4. 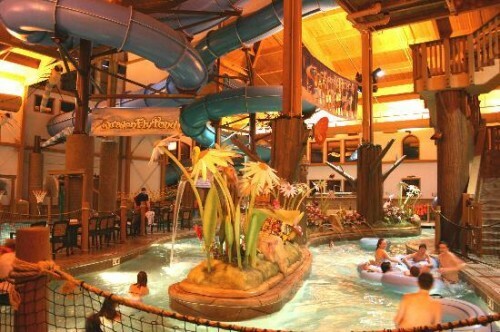 Zehnder’s Splash Village Hotel and Waterpark – located in Frankenmuth, MI. this amazing hotel offers 30,000 square feet of aquatic fun for the whole family. Enjoy the Splash landing play area, Dumping bucket or for the more adventurous take a wild ride on the Giggling gorge and Perilous plunge 4 story tube slides. Relax in the whimsical whirl hot tub or just float along the Crooked Brook Creek lazy river. 5. 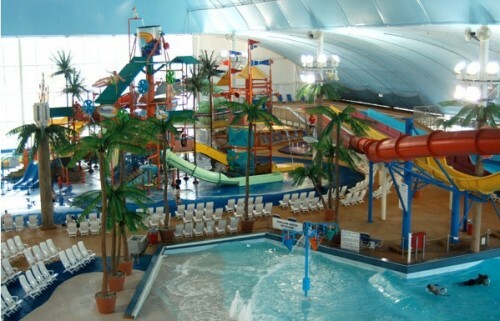 Caribbean Watercove Indoor Waterpark – Attached to the Holiday Inn at the pyramids in Indianapolis, this amazing entertainment complex offers a warm and summery vacation on the coldest day! Families will enjoy 50,000 sq. ft. of waterplay. A splash pad, 3 massive water slides, a plunge pool, lazy river and a pirate ship with a dumping bucket of water await your water loving crew. Also on site is an arcade and 4 restaurants. 6. KeyLime Cove – Located in Illinois, KeyLime Cove Waterpark Resort is also situated conveniently across from Six Flags Great America, which offers two great destinations for family fun(season permitting). Their 65,000 square foot indoor ‘Lost Paradise’ Waterpark has so many waterslides that they had to run the chutes outside the building to have enough space for all of the fun. On top of that they have a wave pool, lazy river, adults-only grotto and a play pool for your little swimmer. 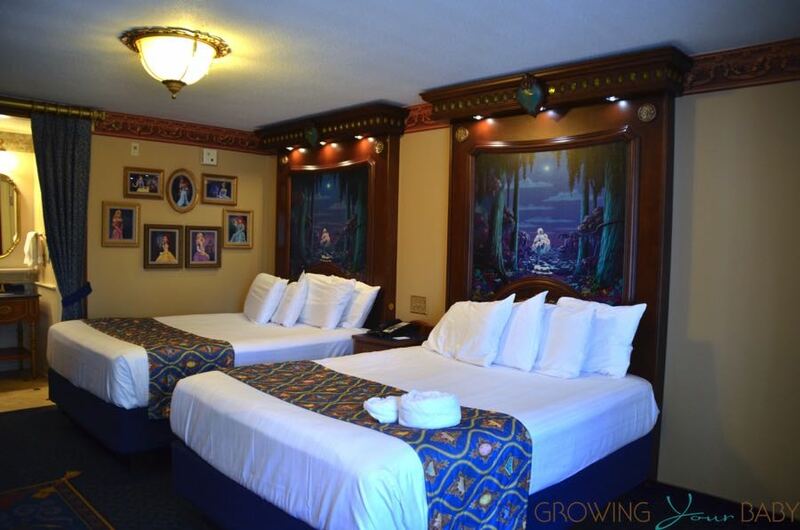 Family Friendly rooms accommodate parties up to to 12 people with connecting rooms. 7. 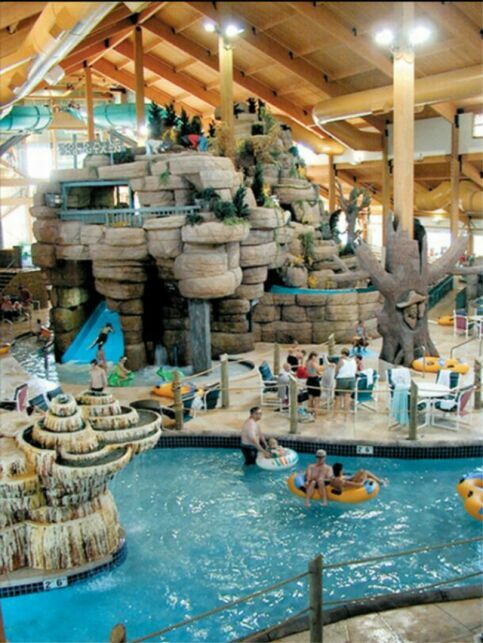 Named as America’s Largest Waterpark Resort the Wilderness Resort in Wisconsin Dells has over 500,000 sq.ft. of indoor and outdoor waterparks. That is over 12 football fields of water fun to explore. Where will you begin? Well you could start at the Wild WaterDome, a 70,000-square-foot indoor waterpark that features the nation’s largest indoor wave pool, Dueling Mammoths, a thrilling family raft racing ride that allows families to race against each other through twisting and turning tunnels and a 2,200 square foot ‘zero-depth’ play lagoon for the smaller ones. 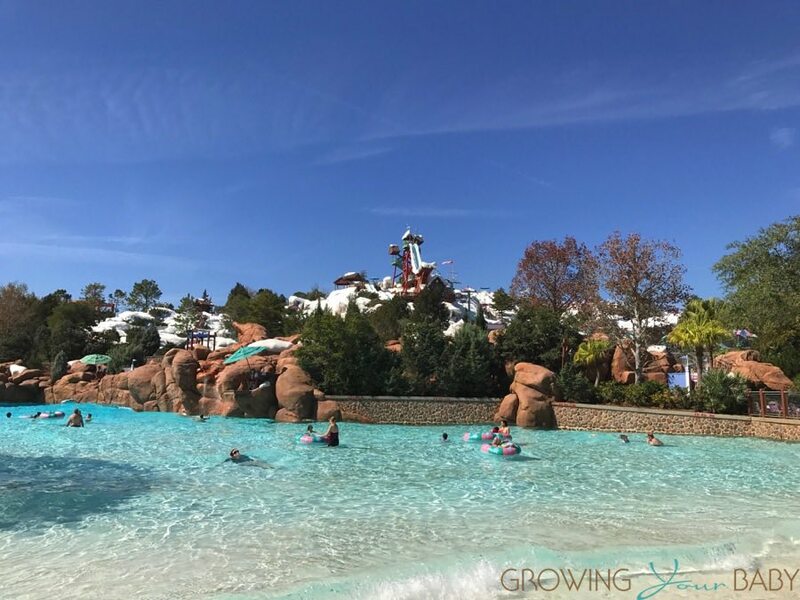 After that you could move on to Klondike Kavern another 65,000 square feet water park with a 180-foot body slide, two 500-foot tube rides which drop five-stories, a 400-foot lazy river and Bonanza Bluff, a huge play feature which includes 50 play & spray features, a 750-gallon tipping bucket, a 20 foot body slide and a 4 foot side by side children’s slide. They apparently don’t mess around in Wilderness territory because this expansive resort also has 2 – 3D mini golf courses, laser tag, a kids club, an arcade and a park for play. 8. 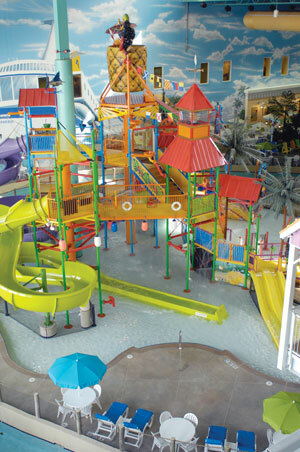 CocoKey Waterpark – This Indoor Waterpark chain has 10 locations in 9 states. 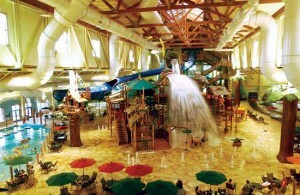 Like with Great Wolf Lodge, CocoKey’s different locations all offer different play options. Families, however, can look forward to a multi-level interactive play island with 4 slides for younger children, an activity pool for kids 6+ that features water basketball and a lily-pad adventure and three 40-foot thrilling body and raft water slides. Other amenities include private poolside cabana rentals, 5 dining options and an arcade.